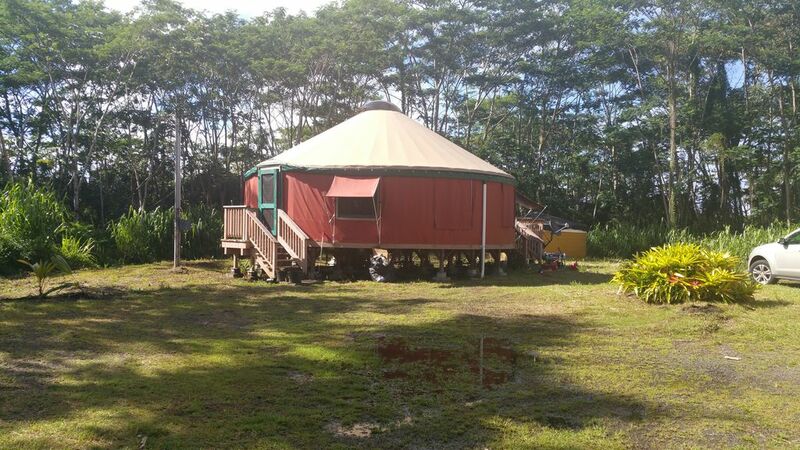 The yurt experience -- relax, unwind in our yurt located in the Hawaiian Paradise Park subdivision. Once acre, peaceful and serene. Listen to the birds, coqui frogs sing you to sleep. Simple living, close to Pahoa town, and Hilo. We are 10 blocks from the ocean. Explore the Big Island and all it has to offer. Hike to view the lava flowing into the ocean or drive to the Volcano National Park and explore the Chain of Craters, Thurston Lava tube, many waterfalls throughout the island, turtle at the Black Sand beach, snorkeling, fishing, hiking, and so much more. We are 20 min from Hilo International Airport. There is 1 queen bed and 1 pullout couch. Great for honeymoon, couples and family getaway. This is an open concept round yurt. Please see photos for bedroom set up and living room with pullout couch. We also offer a driver for daily excursions on the Big Island, as well as Pick-up and Drop Off at the two airports, Kona or Hilo. Please indicate upon making your reservation that you would like to schedule a driver. Driver will contact you with selected local and full day excursions as well as costs or a pick up/drop off at the two airports; Kona or Hilo. satellite internet - with satellite internet our weather at times makes it sporadic. short drive to Volcano National Park, beaches, small town with groceries, gas and farmers market, and larger city with lots of large stores and restaurants. The yurt was great. It was peaceful and so cozy. I loved the unique style yet luxury feel. It had all the amenities we really needed. We stayed for two and a half weeks so a larger fridge would have been handy but other than that we were quite comfortable. The management was very helpful and it was very clean. Decore was lovely.. We would definitely recommend it. A unique experience. We enjoyed the comfort of the yurt but yet felt connected to the outdoors. Lots of sounds out night to fall asleep too and if the get to loud just turn on the box fan. Felt centrally located to places/activities on the Hilo side. Thanks for a great experience. A charming first stay in a yurt - but light sleepers bring earplugs! It was our first time staying in a yurt, so we weren't sure what to expect, but we had a wonderful first experience at the peaceful yurt. While from the outside it seems simple enough, the inside looks like a little chalet! It's very spacious and the living area is very charming and welcoming. We could tell that the owners take great care of making sure that we have everything we need to be comfortable: The kitchenette was well furnished, there are plenty of towels and toiletries for everyone, there were even extra sheets and pillows for chillier nights. It's at a good location as well: a short drive from Hilo, less than an hour from Volcano National Park, and close to the ocean with beautiful scenic drives on the east coast of the island. Our stay at the yurt was wonderful, however if you're a light sleeper I'd recommend bringing earplugs. The coqui frogs will croak throughout the night, which isn't so bad, until the wild roosters join the chorus at 2am and the neighborhood dogs will occasionally jump in as well! Animal orchestra aside, we really enjoyed our stay and would definitely recommend! Awesome time at the yurt, very peaceful and relaxing. I didn't personally mind the bathroom rules, but I do think potential renters should be made aware before renting. Close enough to hear the ocean! Our stay at the yurt was peaceful and relaxing. The furnishings were very comfortable. Jayne the property manager was responsive and helped me greatly when she delivered my forgotten baggage to the airport,above and beyond the call of duty! The only suggestion that we have is a good first aid kit and tongs and brush for the grill...otherwise we loved it! The accommodations were perfect. It was a great way to disconnect from our devices and reconnect with each other. Check in is between 12:00 noon and 5pm (for manager to greet you at the property). If there will be a check in after 5pm -- please contact the manager - cell phone is 775-790-3484 for lock box access information.